During the international EAMHID Congress in Luxembourg (September 2017) several participants from the hosting organisation, APEMH, had the opportunity to assist to different pre-courses, workshops and/or symposia focused on emotional development and mental health in persons with intellectual disability (ID). 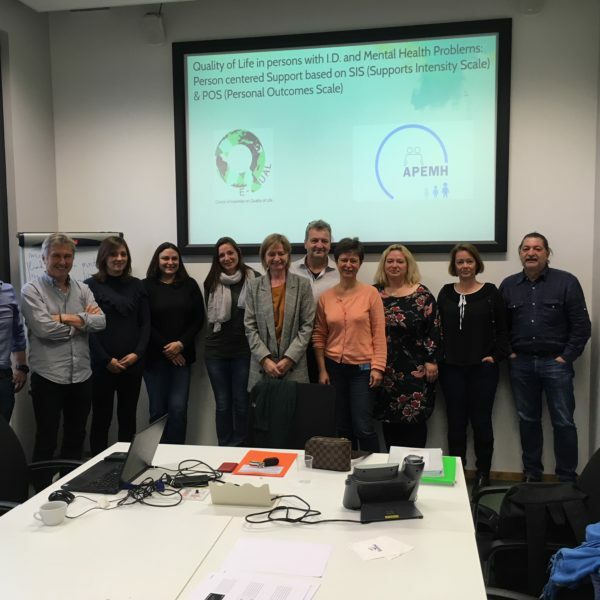 The interest to further deepen this subject and explore new ways to identify application fields in their services motivated the APEMH “Quality Development Unit” to apply for a mobility project through Key action 1 in the European Erasmus+ Programme. Psychiatric Department of Evangelisches Krankenhaus Königin Elisabeth in Berlin – Germany (contact: Tanja Sappock). The first mobility to Gent took place in October 2018, and saw a delegation of 6 staff members from APEMH having rich exchanges over two days, perfectly organised under the supervision of Filip Morisse and Erik De Belie. visits to services and exchanges with social workers and therapists applying these approaches on the field. It was interesting to focus on the impact of environment and support staff (in addition to impact on users): it helps to better supervise staff, support them in changing attitudes and have objective tools to work on what teams really need. Another concrete output of this visit was the exchange and transfer of tools and research articles on the treated subjects, as well as first proposals for future possible collaborations: setting up of supporting tools and outcome evaluation tools (with a possible translation of them) at APEMH level, and an adaption of the MENTEMO game to support and promote the emotional availability of the staff involved. Finally, we can say that this first exchange of good practises gave us a good example of what could be a more regular and constructive collaboration between our 2 European NGOs, EAMHID and ARFIE, and their members, to promote mental health and quality of life of persons with intellectual disabilities and their environment. These projects give an excellent opportunity to link research and applied studies to staff training, as well as practical support experiences on the field. The Erasmus+ programme proposes different key actions that promotes and facilitate these collaborations and partnerships: mobility programmes, exchange of good practice projects, strategical partnerships, etc. We should promote and amplify this sort of cooperation using the rich opportunities and expertise offered by our NGOs’ networks!! A big thanks again to Filip and his team for this positive experience. We are looking forward to the next mobilities to enforce this first experience ….. and hoping to have stimulated your interest to multiply these co-productive attempts for collaboration.